Festival Ballet Theater dancers perform excerpts from the Nutcracker in the Dawson Cole Gallery. 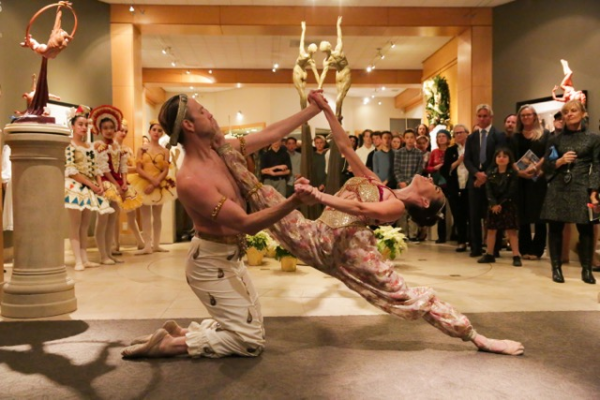 Dawson Cole Fine Art Gallery owners Rich and Ariane MacDonald hosted a performance by dancers in the Festival Ballet Theatre in December as a benefit for the Boys & Girls Club of Laguna Beach. Prior to the dance performance, the gallery held a toy and clothing drive to help families in need. Laguna Beach Republicans, who meet Wednesday, Jan. 17, at Mozambique, 1740 S. Coast Highway, will discuss the potential for a ballot initiative to underground utilities. The 6 p.m. meeting is preceded by a social hour. Club President Emil Monda will also discuss candidates for local elections in 2018. Laguna Beach residents planning to attend the Orange County Women’s March in Santa An on Saturday, Jan. 20th, can now leave their cars behind. Laguna Unites, which emerged from last year’s march, has arranged for round-trip bus transportation for marchers departing at 8 a.m. from the school district lot. Cost is $20; $40 for lunch and commemorative T-shirt. Register by Jan. 15 at [email protected]. Payment can then be made by check, Google Wallet, or cash. Laguna Beach residents are invited to apply for openings on the city’s Recreation Committee, Design Review Board, Parking, Traffic and Circulation Committee, Heritage Committee, Environmental Sustainability Committee, View Restoration Committee and Affordable Housing Task Force. Applications are due to the city clerk by 5:30 p.m. on Monday, Jan. 22. Interviews and appointments will be conducted on Tuesday, Feb. 6 at 6 p.m. during the regular City Council meeting. Obtain an application from the city clerk’s office or the city’s website. Questions may be directed to City Clerk Lisette Chel-Walker at 949 497-0705. Parents searching for a way to bring calm into their home and improve communication with their children may benefit from a mindfulness workshop teaching practices that lower stress and anxiety that can be incorporated into a daily routine. Lucas Leardmann, of UC San Diego’s School of Mindfulness, will lead the three-week workshop, sponsored by Mission Hospital. The 9:30-11:30 a.m. workshops are Saturdays from Jan. 27 through Feb. 10 at the Susi Q Center, 380 Third St. Fee is $15 for the series and scholarships are available. A draft of a local hazard mitigation plan will be open for public review until Tuesday, March 6. The plan provides a foundation for long-term strategies for protecting people and property from future hazards and is a condition for receiving some non-emergency disaster assistance. The plan is available on the city’s website and at the city clerk’s office, Susi Q Center and the public library. Jordan Villwock, the city’s emergency operations coordinator, is taking public input at [email protected] or 949 497-0389. The community is invited to celebrate the 2018 Patriots Day Parade honorees Sunday, Feb. 4, in brunch at Tivoli Terrace on the Festival of Arts’ grounds. The event runs from 11:15 a.m. to 1:15 p.m.
Honorees for the March 3 parade are Gloria Fickling, grand marshal; George Ciampa (WWII), honored patriot; Heidi Miller, citizen of the year; Marisa Schatz and Joseph Ravenna, junior citizens of the year; Laguna Art Museum, as artist of the year; and water polo Junior Olympic champions, athletes of the year. RSVP at $30 per person by Jan. 22. Further info: [email protected] or 949 494-6016. 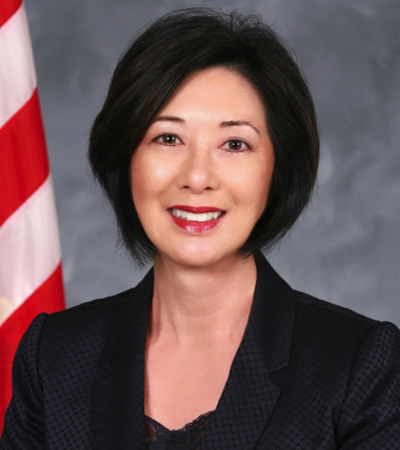 Fifth District Orange County Supervisor Lisa Bartlett was selected as the new chair of the Orange County Transportation Authority board. Bartlett served as the agency’s vice chair for the last year. She replaces outgoing Chair Michael Hennessey, who remains on the board as one of two public members. Bartlett also serves on the boards of CalOptima, Orange County Fire Authority, Transportation Corridor Agencies and the Orange County Local Agency Formation Commission. Previously, she served for eight years on the Dana Point City Council.